Friday was an official training day for the cross-country athletes, but the Sea to Sky Nordic Festival isn’t all about cross country. While biathlon wrapped up earlier, Ski Jumping and Nordic Combined had their first competitions on Friday. Fast and Female hosted an event, and there were lectures on coaching female athletes. Canadian World Cup Team members Dasha Gaiazova and Lenny Valjas demonstrated how classic sprinting is done at Canadian Nationals on Thursday, winning their respective qualifiers and later commanding the finals to achieve national titles. Fresh off a flight from Sweden, Dasha Gaiazova entered her first race of Canadian Nationals firing all cylinders, beating Japan's Chisa Obayasi by nearly 1 1/2 minutes in Tuesday's 10 k classic interval start in Whistler, B.C. 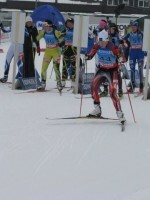 Brent McMurtry captured his first national title in the men's 15 k, 23 seconds ahead of Norway's Rune Ødegärd. We know, we know: it's FAHL-IN. But still. The World Cup wrapped up with spectacular races and plenty of sun in Stockholm and Falun, with Justyna Kowalczyk and Petter Northug winning the season-long titles and Kikkan Randall taking home not only the Sprint Cup but also third place in the overall. Plus, racing on this side of the pond at Whistler and Craftsbury. Heidi Widmer, 22, rolled to her first individual gold and second title in as many days of racing at Canadian Nationals, while the 33-year-old IPC World Cup extraordinaire Brian McKeever won his first Canadian championship just days after flying from Sochi, Russia. Caitlin Gregg and Eliska Hajkova of the U.S. took first and second overall in the 5 k freestyle, and Canadians swept the men's 10 k podium. Jess Cockney stayed upright despite a tangle in the finishing straight to notch his second-straight team sprint title with Brent McMurtry at Canadian Nationals on Saturday, and Marlis Kromm and Heidi Widmer skied to a nearly 10-second victory in the women's race. Audrey Vaillancourt (Quebec) completed her set of three titles at 2013 Canadian Biathlon Championships with a photo finish victory over Megan Heinicke (Biathlon BC) on Tuesday. Audrey Vaillancourt (Quebec) made it two for two, winning the pursuit at Canadian Biathlon Championships at Whistler Olympic Park on Sunday. Vaillancourt started first after her Saturday sprint victory and finished first despite missing four shots (1+0+1+2) in 31:43.4 for the fastest ski time of the day. World Cup Period II starts on Saturday when the Tour de Ski kicks off in Oberhoff, Germany. FasterSkier takes a quick look at the Red Group rankings heading into the next World Cup period.